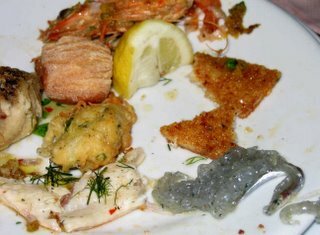 Another seafood eating extravaganza took place yesterday afternoon at Trattoria (trah-tor-EE-uh) Incognito in Acireale (AH-chee-ree-AH-lee) down by the sea. My friend Pat used to go there years ago, and she knows the whole family who runs this tiny little hole-in-wall place. 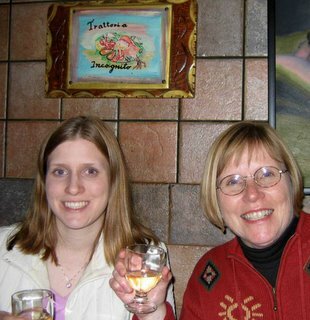 They all call her by her first name, and every time a new dish was brought to our table (about every five minutes), the son-waiter would bring it to her first and say her name, "Patricia" (Pa-TREEZ-ee-uh), and then explain what it was so she could explain it to the other seven of us in English. You'd never know it was a restaurant from the outside, as there is no other indicator than a bunch of people standing around outside waiting to get in! Luckily, though, we had a reservation for 3:00 PM for lunch and we didn't have to wait. I think they only serve lunch. The inside is small and cozy and Sicilian. Like others I've been to, this restaurant doesn't have a menu, but you just have what they are serving (like going to someone's house?). We seated at a table with white wine and water and started with the antipasti, which really can be the entire meal in itself and almost was. We had probably over twenty varieties of seafood and fish of all kinds, including octopus, swordfish, dolphin, shrimp, mussels, clams, and sunfish pickled, fried, cold, warm, in the shell, on the shell, spicey, sweet, sour, garlickly, marinated, baked in pastry, skewered, and on and on and on. Each one was served separately family-style and we passed, passed, passed the dished around, piling up the empty ones in the middle. They were taken away and new ones brought to us. Probably the most unusual ones were "neo-natzi" fish, which are also known as "glass fish" because they are so tiny and new-born you can see right through them. (See the gray item in photo) We had them raw and also fried in a pastry. That might have been the only dish that anyone even considered passing on. So, the antipasti went on like that for about an hour. We could have ended there, but most of us wanted to try some pasta dishes, too. In between courses, they brought us each a small lobster on the half-shell . . . just as a filler? We had three types of pasta--red, white, and black! The red one was a tomato sauce with seafood, the white was spaghetti vongole with mussels and garlic, and the black was spaghetti neri with squid ink. They were awesome--what else can I say? The black spaghetti had a large dollop of fresh ricotta on it, which none of us had seen before, but it was a nice contrast in color. 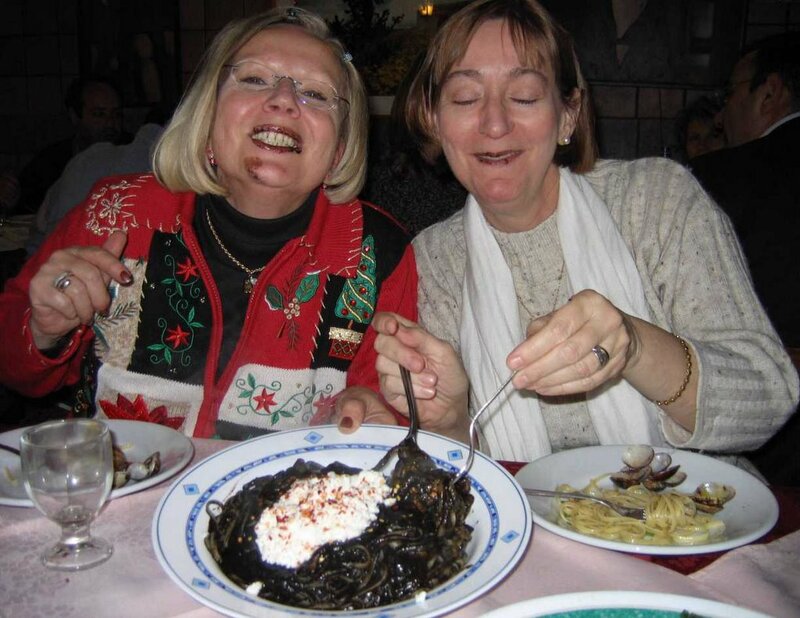 Several in our party had never had the black spaghetti before, but everyone liked it, as usually happens. By then, we'd had it. We ended with a very special sorbet that could be sipped. The waiter mixed in grappa, limoncello, and fragolino (strawberry liqueur) and it was delicious--the perfect palate cleanser! We then stumbled, waddled, or wandered across the street for an expresso. We needed it to stay awake for the drive home! Well, the Simply Red concert in Acireale on Sunday was simply fantastic! Except for the tight and uncomfortable seating and the noisy Italians who wanted to talk aloud during songs and take cellphone photos throughout, it was probably the best live performance I have personally ever seen. Mick Hucknall sang for over 90 minutes and every song was a masterpiece of delivery, starting with slow ballads and jazzy numbers and ending with loud, fast numbers. For an aging, moon-faced, short, pudgy 45-year-old, he still has a fantastic voice and great stage presence. Every number sounded exactly like the recording and looked fabulous. He had ten violinists and two bass cellos along with his regular band of guitars, horns, drums, piano, and two female backup singers. Even my friend Pat, who had seriously never heard of Simply Red, greatly enjoyed the concert. (She's lived in Italy a LONG time.) She remarked that his lyrics were so meaningful. I have to agree. I had forgotten all the wonderful songs and lyrics Simply Red has produced. Remember "Something Got Me Started" ("I'd give it all up for you . . . "), "Fairground" ("And I love the thought of coming home to you . . . "), "Ev'ry Time We Say Goodbye" (I die a little . . ."), and "Stars" ("I wanna fall from the stars/Straight into your arms . . . ")? Or how about "You Make Me Feel Brand New" ("Precious friend/With you I'll always have a friend/You're someone who I can depend/To walk a path that never ends . . . ")? And then there was "Come to My Aid" ("I feel so betrayed/By the people I love/Come to my aid/It's you I'm thinking of . . . ") There's just so much human feeling and truth in all of his lyrics. Everyone's been there, done that, felt that. I think my personal favorite though, was a rendition of a Bob Dylan song, "Positively 4th Street," during which the singer's voice got angrier and louder, ending with "Yes, I wish that for just one time/You could stand inside my shoes/You'd know what a drag it is/To see you." The six of us went out for pizza afterwards. It was kind of ironic that they had a live 3-piece band playing there. The singers kept coming to our table and serenading us face-to-face, not knowing, of course, that they had no chance against Simply Red. They were simply amateurs. 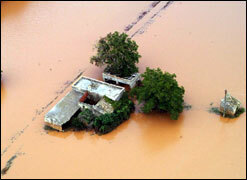 See this link for another story and some interesting photos of the flood: Stars and Stripes . We heard yesterday that 200+ families were relocated to hotels and temporary lodging facilities. To see a great shop of Mt. Etna covered with snow from the rainfall, look at Phil and Aja's blog, "Sicilian Newlyweds" in the sidebar. Photo courtesy of U.S. Navy The military housing complex of Marinai at Naval Air Station Sigonella, Sicily, was evacuated Thursday morning after days of heavy rain and thunderstorms flooded the area, which sits in a valley. The complex houses about 475 families, all of whom were safely moved to area hotels. Some houses had up to 3 feet of water inside, officials said. “The only way to get into [Marinai] was in a Humvee with snorkel kits. Other people in the Humvees were wearing wet suits, and they needed them,” Preston said during a telephone interview from Sigonella. Read the whole story in today's Stars and Stripes. It's worse than any of us expected. Several hundred families ARE being evacuated from the one of the naval housing areas (Marinai Housing) here. My friend and colleague Anne and her two daughters were among the victims. She showed me the photos today of "the flood" that crept up, up, up as they helplessly watched from the roof of their house. Her husband is deployed to Kuwait and due to get home any day. The water outside was well over a foot high and into cars. Dumpsters were floating around banging into cars as people could do nothing but watch. Anne was awake while it was happening, but most were sleeping and many families were already gone on holiday vacations. She was able to get things up and off the floor (like all their Christmas presents). She has a photo of their tree surrounded by several inches of muddy water. They hoisted her leather couch up on two large plastic boxes, and a friend came over to get the brand new china cabinet out of the water. When her daughter went out to help a friend, the current swept her off her feet and took her about twenty feet. Now all the units are filled downstairs with yucky, sticky, dirty mud. They have no electricity and no water, so cleanup is impossible. Buses came and took families up to NAS I (where the school is) to register for shelter and assitance. The Red Cross, Navy, and civilian volunteers worked tirelessly to help the families. People are being asked to take family pets, which can't go to temporary lodging facilities in most cases. Families were literally walking around on our base with their things in shopping carts, like homeless people (which is what they are at the moment). The Food Court was jammed; I've never seen so many people in it. I expect them to run out of food by tomorrow (at least Taco Bell and Popeye's will). Earlier today, they had not been ordered to leave their quarters on Marinai, but I feel that might be coming. There are no serious injuries, but what a horrible way to have Christmas. We had no students today and none tomorrow. Many of my colleagues were volunteering and working to help others all day today. Here's a link to the story in the European Stars and Stripes. Yesterday afternoon, a teacher's worst nightmare almost became a reality. We were told that we might be stuck overnight in our classrooms with our students!!! In my case, this was especially bad, because the students I had at that time were 8th graders in my "advisory" period, something like a study hall, not even a real class. Anyone who has taught or had children of their own of this age group can sympathize with my predicament. Luckily, at 3:30 P.M., after already being in the same room with them for 2 1/2 hours, we got word that they were to take their stuff and make a dash for the buses, which had finally arrived and were to take them home. THANK GOD! At the same time, we teachers grabbed our stuff and hastily formed caravans of cars to head home ourselves. Most of us live quite far from school, in my case, 18 miles up Mt. Etna. I gathered with four others and we took two cars, including mine. Luckily, the rain slowed and almost stopped, so we drove home without any problems. There were practically NO Italians out on the roads or streets, a very strange sight at 4:30 in the afternoon. As we neared home, a heavy fog moved in and it began to rain again. I got drenched just going from my car to my house. We have no school today because of the RAIN. It has been raining for more than twenty-four hours, usually quite heavily. Apparently, a depression called "Lucia" has caused this torrential downpour or nubifragio ("cloudburst," as the Italians call it), resulting in serious flooding and a state of emergency. This is why we didn't see anyone out yesterday afternoon except silly Americans! 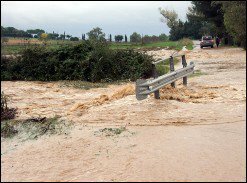 Sicily is generally a pretty dry place, and too much rain too fast causes overflowing rivers and flooding of roads and streets. They also have practically NO drainage in the way of storm sewers. The rain that falls on Etna pretty much just flows right down the roads, making driving an especially interesting activity. I guess the silver lining in this giant dark cloud is 1) no school today, and 2) little smiling suns are starting to appear on the weather map in the western part of Sicily, meaning the rain will stop, eventually. Stay tuned. Today I accidentally locked my house keys inside my house, and as I waited for my landlord's son to come and let me in, I speculated that I'd be at least half an hour late for the Christmas party our faculties were having at a hotel-restaurant. Luckily, in Sicily, that meant I would still be there before anything really happened. And I was right. When I got there, half an hour late, everyone was standing around chatting, no one was seated, nothing was ready, and others were arriving even after me. Here you see us seated and waiting for the next course. This is normal in Sicily. Times are "suggestions," kind of like stop lights and road signs. Practically no one arrives at the actual time of an event. Even the opera started a little late. 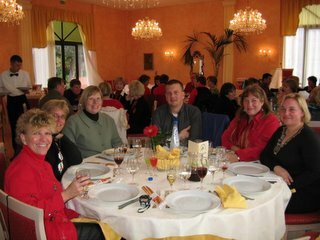 I've been to restaurants with large parties, where, of course we had a reservation, and the staff seem quite surprised to see us there. They do start to get things together, but it takes a while. Meals themselves can last for hours if all the courses are taken. 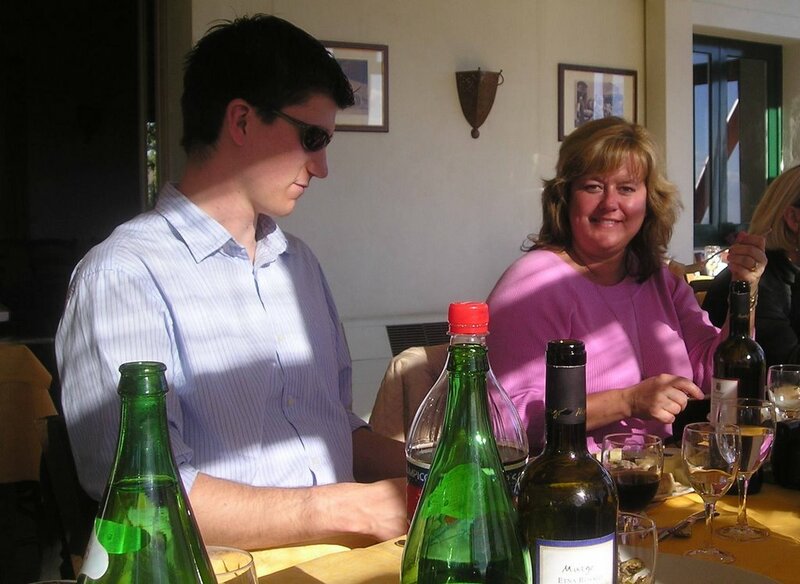 Here you see Phil and Leslie enjoying a four-hour lunch at the Murgo Winery recently. I found this out when I arranged a TGIF event for about fifty people last fall. I rushed to the place just before it was scheduled to start, and NOTHING had even been started. Where were the food, drinks, bar, and tables? Eventually, it all got done and came together, but on Sicilian time, and slowly. Meals can take hours, especially if all the courses are taken. The evening meal is usually eaten quite late, which is why Americans rarely go out to eat during the work week. Who can eat at ten, eleven, even midnight and then get up at five to go to work? The earliest you might find a restaurant open for diners is 7:30, more often 8:00 PM. Sometimes they'll tell you to come back at 8:30. The cook and kitchen staff are still eating their own supper, and they're not about to jump up and cook for customers yet! So, when I do go out, we are usually the first ones in the restaurant and have eaten, paid, and are leaving just as the Sicilians are coming in. Great-grannies and little children, all coming out to eat at 10:00 PM! On a weeknight! On the other hand, don't attempt to buy anything, even gas, during pausa or riposo, which is from 1:00 to 4:00 in the afternoon. Except for a few large (foreign) superstores which have now started to stay open during those hours, everything shuts down but restaurants, as the Sicilians take their rest . . . probably so they can stay out past midnight having supper! I've always been a fan of Baroque architecture, and Sicily does it particularly well. For one thing, the interior of every single church I've seen is Baroque! No matter how old or decrepit the church is on the outside, it will have a beautiful ornate Baroque interior, for sure, all white and gold and painted ceilings, swirls, and light. I love it. 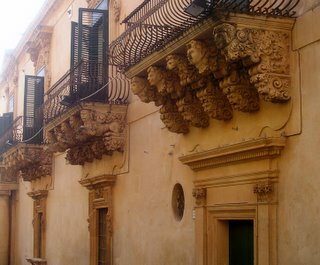 One can see Baroque just about everywhere on the eastern side of the island (MY side), and, when I heard about the "Baroque towns of Sicily," I put them high on my "must-see" list. Catania has lots of it, Siracusa even more, but THE Baroque towns are Noto, Ragusa, and Modica, all in the southeastern part of Sicily. Why these three towns? Well, unfortunately, or fortunately, they were all destroyed in a huge earthquake in 1693 and rebuilt when Baroque was at its most popular and opulent. So, out of a tragedy that killed over 60,000 people came these new Baroque towns. What kind of optimism those Sicilians must have had to rebuild in this bold new style! On a sunny, warm day in early November, I had the chance to visit Noto (I'm hoping to see the other two over Christmas). It's like walking through a movie set, there's so much in a small space! Churches, public buildings, palaces, fountains, the theater--all, all in fantastically beautiful Baroque! 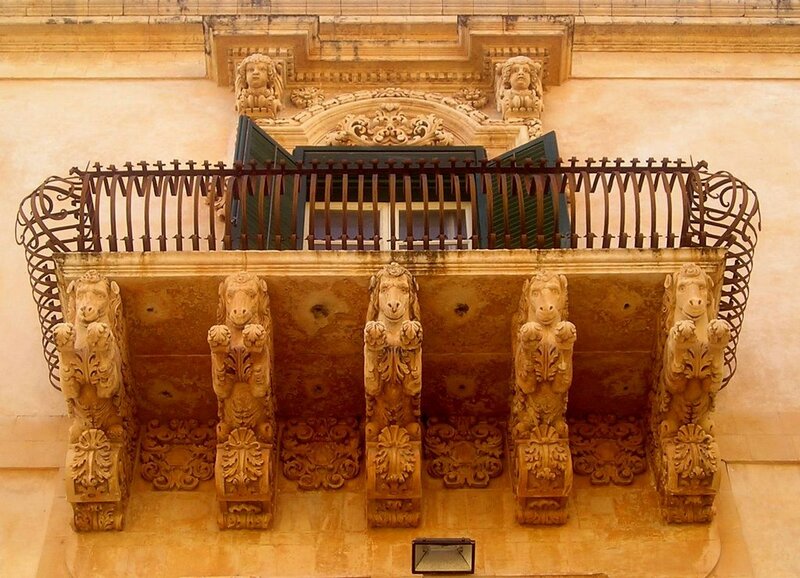 Recently, Noto became a UNESCO site, which means lots of money from the outside is being put into restoring and saving the old buildings. Because Sicily has been the poorest part of Italy for so long, it's really quite run-down and even falling-down in some places. It reminds me of the Czech Republic right after the Iron Curtain lifted--beautiful, opulent, but really run-down. So it is with Noto, although much has already been restored and it's wonderful see the others in progress. In Noto, most of the important buildings are on one street which is easy to walk up and down. 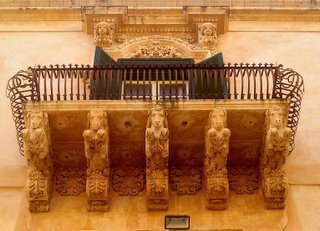 Noto is, in fact, not a big town, anyway, which rather makes the sheer amount of Baroque architecture even more phenomenal. The other important buildings are just one street either way of the main street, which is the Corso Vittorio Emmanuele. On it you'll find the cathedral, the theater, the Palazzo Ducezio, several other churches and palaces. Turn up the hill on any side street and you'll find even more fabulous examples! 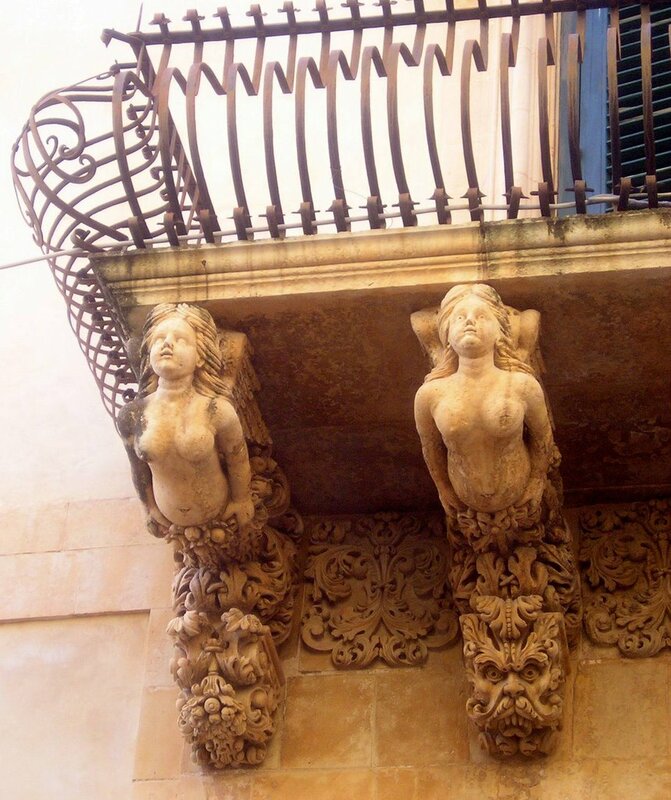 My personal favorite is the Palazzo Nicolaci for its ornate balconies and windows. Hopefully, the cathedral will be unveiled and opened soon. It's already overdue. Apparently, the entire ceiling fell in in 1996, luckily killing no one, although a couple of priests were inside. 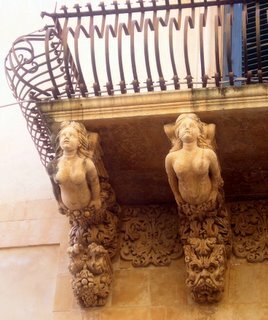 It had been weakened in an earthquake a few years earlier and the money somehow never got there to repair it (typical Sicilian graft). But now, it is being rebuilt and repaired and should open soon, re-establishing itself as the center of the town.